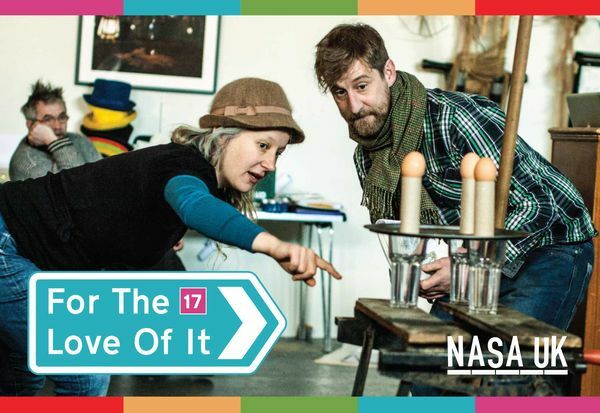 Join others interested/involved in outdoor arts at NASA’s annual gathering of Outdoor and Street Arts professionals – a weekend of inspiration, creation and fun, a chance to recharge and re-connect. What is For the Love Of It? Heba El-Sheikh with her colleague Reem El Sayed El Sakka Khedr from Egypt (supported by British Council Egypt). Heba is a creative producer who co-founded Mahatat, a contemporary art company based in Cairo. She also co-founded The “Journey Cultural Group” in Alexandria, aiming to promote youth creativity and critical thinking through culture and arts. She has written about ‘Art in Public Space in Egypt’ looking at cultural life after the ‘Arab Spring’, and about Audiences and Art in the Public Space in Egypt. She will talk about the challenges of presenting community orientated work in Egypt and the work she has done with a collection of amazing artists. Floriane Gaber is a Belgian writer, researcher, journalist and teacher based in Paris. She is a well-travelled commentator and critic of street theatre, mime, circus and spoken/written word performance. She has been published widely and is a regular contributor to arts journals and magazines. She will talk about the political context of outdoor arts, from protests against the Vietnam war in 1968 to the social implications of artists working on the streets of Belarus today, including shows that she’s seen and artists that she’s worked with. Plus a provocation from Jeremy Shine! NASA ask that everybody does something, – could be washing up, could be offering a 3 minute moment at our mini-cabaret evening, could be suggesting a theme to discuss or sharing a technique with a small group…or any/all of the above!